Last night Final Fantasy XIV: Online Producer & Director Naoki Yoshida took to the main stage in front of 15,000 in-person attendees and the world via livestream to reveal even more information about the MMO’s third expansion, Shadowbringers. 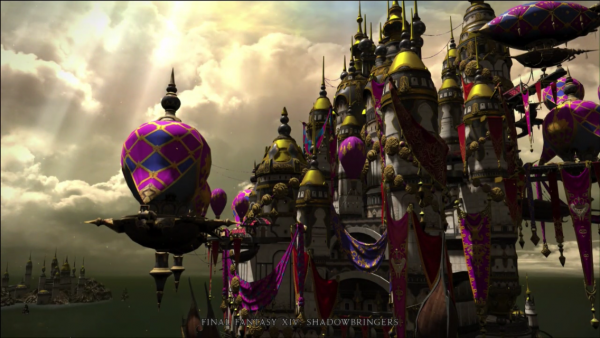 Confirmed during the 90 minute presentation were the location for the expansion, the highly rumoured Dancer job, several major cities to be featured in Shadowbringers, not one but two playable races and finally the theme for the 8-person end game raids. Future Warriors of Darkness will be headed to a region known as Novrandt but that players will better know as the First Shard, the reflection of Hydaelym where Heavenwards Warriors of Darkness came from. It is a world of perpetual daylight, where “the sun” never sets due to the overwhelming imbalance of the Light aspect Aether that has enveloped Novarandt. During the MSQ we’ll have to restore the aetherial balance, welcome Darkness back to the First Shard and bring night upon the Shard for the first time in who knows how long. Now that we know that The First is where our characters will land in 5.0, it also confirms that the previously revealed zones of Il Mheg, The Rak’tika Greatwood and Amh Araeng are not on the Source world where the Warrior of Light originates. Yesterday’s KeyNote address revealed an additional area called “Lakeland” which is where our adventures on The First Shard will begin. If you’re looking at the architecture featured within the city screenshots in this article and feel that they are familiar, don’t be alarmed, the designs take a lot of influence from previously revealed FFXIV concept videos and even the original 1.0 release! 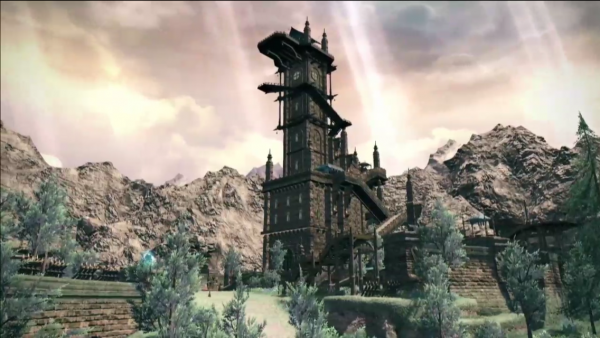 Civilization within The First Shard is nothing like that of Hydaelyn. Facing the pressure of a looming Calamity of Light that could wipe out the entire Shard, the people of The First struggle to survive within two large city states that act as their last bastion. 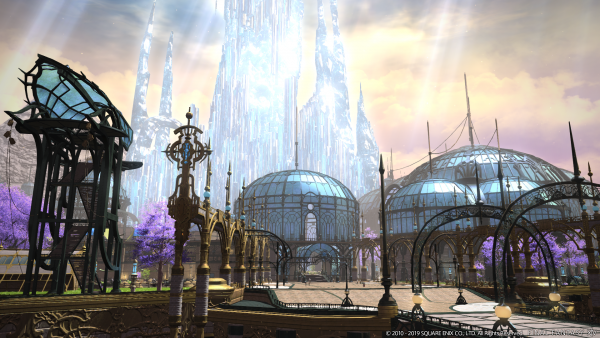 The Crystarium – Home to the First Shard’s Crystal Tower, The Crystarium takes a lot of design cues from a 2005 tech demo called “Rapture” and 1.0 Limsa. Surprisingly, this area was also featured a piece of concept art released for the Red Mage job in 2017. Eulmore – An alternate version Ul Dah, this brightly coloured purple & yellow city houses the affluent and politically powerful who are sheltered from the horrors of the Calamity of Light while the majority of the population live in shambles outside of the city. Previous leaks pointed to Dancer being the new job revealed for Shadowbringers and this turned out to be 100% correct. While many in the community expected Dancer to be a healer, similar to how they were in Final Fantasy XI, given XIV’s delicate healer balance and how gameplay mechanics for the role alternate between shielding / healing, it does make more sense for Dancer to be a DPS. 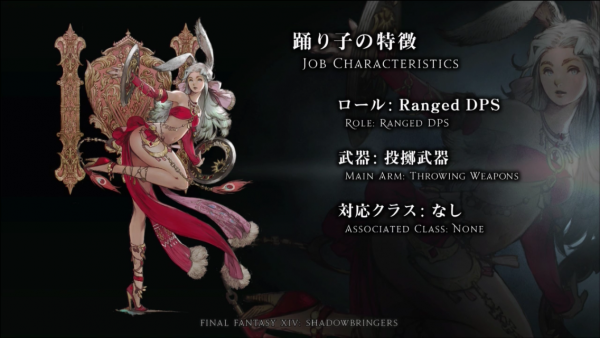 Dancer will join Bard and Machinist in the category of Ranged DPS, it will utilize “throwing weapons” and like the previously revealed GunBreaker will start at level 60. A new raid series was announced for the expected 8 person raids that are one of the key features of the “even numbered” patches (5.0, 5.2, 5.4). Previously we ‘ve got raids for The Binding Coil of Bahamut, Alexander and The Bend of Time: Omega and now we’ll be visiting “The Garden of Hope: Eden”. Right now we don’t have much to go on in terms of tangible story details or even the bosses that we will be encountering. It was revealed that guest creator Testsuya Nomura (Final Fantasy VII:R, Final Fantasy Versus XIII, Kingdom Hearts) will be designing an original character for the Eden series of raids alongside the monster designs. 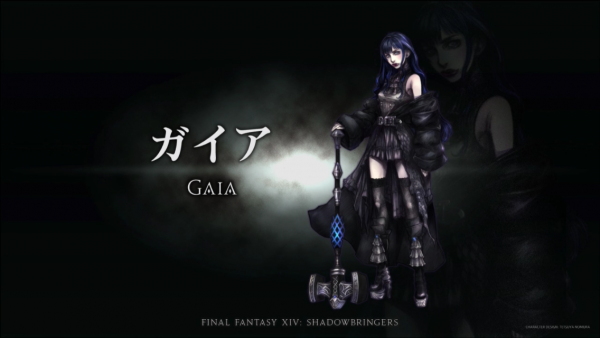 As for Gaia (Nomura’s character) – well she has a very intricate outfit (as to be expected of Nomura), that I instantly want as a glamour, and weilds a really big hammer. As fellow FFXIV players know – there isn’t a “hammer job” within XIV currently, nor has one been announced. The closest we’ve ever come is the “Magitek Hammer” that villain turned comedy relief Nero Tol Scaeva uses in combat, so chances are we won’t be getting a hammer job any time soon. 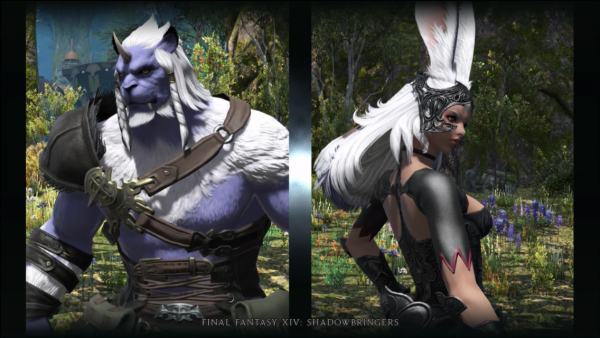 Viera aren’t the only new race that will come with the release of Final Fantasy XIV 5.0: Shadowbringers. Revealed during the Keynote, a new male exclusive race known as the “Hrothgar” will make their presence known across Hydaelyn and beyond. Featuring a large bulky stature, similar in size it appears to the Roegadyn, and with more beastly features than the existing Miqo – the Hrothgar bring a more feral and animal like appearance to the denizens of FFXIV’s world. It should be noted that the Hrothgar will be gender locked to males only while the bunny-like Viera are locked to female only. Gender locking races is something that the 2010 version of Final Fantasy XIV did with Female Only Miqo and Male Only Roegadyn before Yoshida’s team reversed the decision with the release of A Realm Reborn. 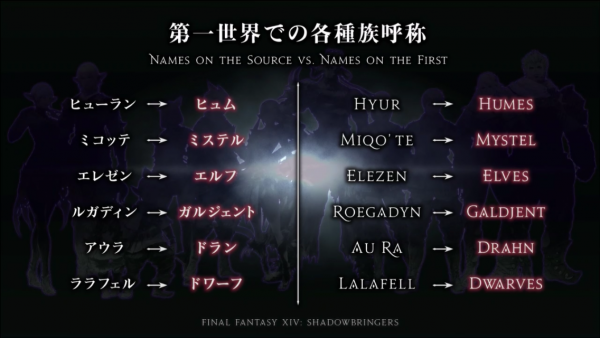 Speaking about the races of Hydaelyn and The First, all of the races that we’ve come to know actually have different names on The First, since both societies have evolved since the split. For example the Hyur are known as the Humes while the Miqo are known as the Mystel. Oh, and the Lalafel are the First Shard’s Dwarves – who are also a Beast Tribe. As longtime player of Final Fantasy XIV who started in Patch 2.3 it is always exciting to see where we will be going with the major content updates that expansion launches bring. 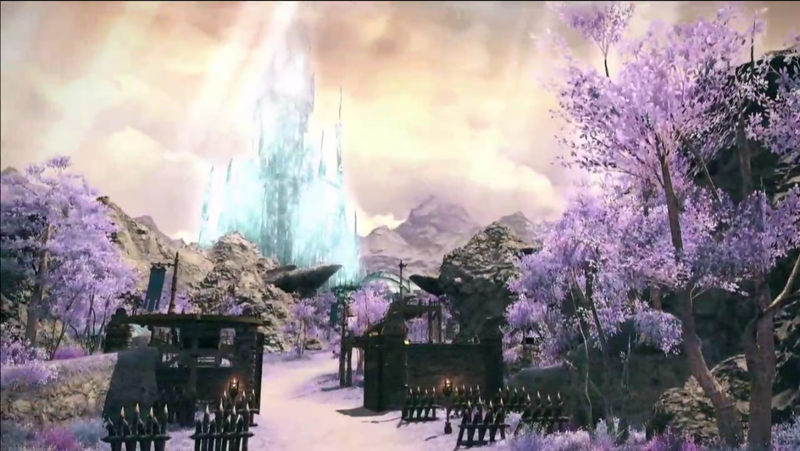 I am really excited and pleased with the choice of The First Shard as the location for Shadowbringers. All of the zones revealed thus far feature really vibrant colour pallets and oh my gosh – all of those early development and 1.x callbacks within the city designs. I never got to experience the pre-calamity version of Eorzea but FFXIV’s lore, Main Scenario Quests and world is something that has had a huge impact on not just myself but family and friends. My spouse and I always look forward to “patch day” when we have new trails, raids and main story content to make our way through and digest. As a Machinist Main I personally can’t wait wait for the job changes, 4.x MCH really solidified that it’s my favourite role – utilizing turrets, flamethrowers and jumping around feels awesome. I’m personally disappointed with the decision to gender lock the two new races, especially since this is something Yoshida’s team has been working to move away from all the way back in ARR. It won’t personally affect my enjoyment of Shadowbringers since Reka is a Miqo and I’d never use a fantasia on her, but other players being upset about the gender locking is understandable. Before making our journey to The First Shard several patches are expected between now and the official July 2nd release. 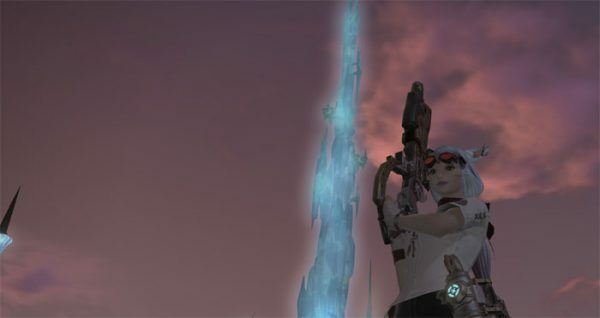 4.56 will launch this coming Tuesday to wrap up the Main Scenario Quests until Shadowbringers launches. 4.57 will bring the “World Visit System” allowing Warriors of Light to visit any world on their datacenters, it will also bring a reshuffle of the North American and European servers – including my home of Balmung. Further details about Shadowbringers, combat changes, the Dancer job and The First are expected to be revealed later this weekend throughout the Japanese Fanfest and at various Media Tours in North America, Europe and Japan sometime in mid-May 2019.